So today I heard that old familiar sound of the “what can brown do for you” diesel and like Pavlov’s dog…. or my dog for that matter my saliva glands kicked in. Could it be a new longboard deck? Much to my delight it was. A Loaded Dervish in a plain brown box was handed to me. It took all of 2 seconds to start the build, as it does with any new ride I get my hands on. I love our boards and nine times out of ten I will be riding a Street Swell but that doesn’t mean I can enjoy another companies vision. I set the dervish up with Paris 180 trucks, Abec 11 Gumballs and Panther abec 7 bearings. The Loaded is a flex machine, much different than what I am used to, but the thing was killer. In combination with the gumballs this was also a flip flop machine, not that I encourage that kind of blatant disregard for safety. It took little to no effort to crank turns even at the slowest of speeds, great when you are in traffic or on the “bike” path……..yeah right. The drop through truck mounting made kicking in flops a breeze because of the lowered deck height. AGAIN, not that I encourage that kind of blatant disregard for safety. This is a really fun board that I think it is a must for anyone’s collection. 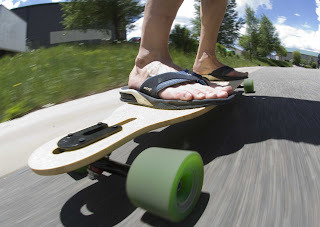 I hope you all know by now, you can’t have just one longboard. Well as always safety first and go for a ride, I am.